Purpose: The purpose of the study was to assess the usefulness of high-resolution ultrasonography (HRU) in the evaluation of diabetic peripheral neuropathy (DPN). Methods: Thirty-seven adult diabetic patients with clinically diagnosed DPN and 45 healthy adult volunteers were included in the study. HRU of the right medial, ulnar, common peroneal, and posterior tibial nerves was done. The mean cross-sectional area (CSA) of the involved nerves was measured in the two groups at identical positions. The CSA was compared between the two groups, and Student t-test was applied to assess statistical significance. Results: There was a significant increase in the CSA of the median, ulnar, common peroneal, and posterior tibial nerve in DPN patients as compared to healthy volunteers. Sonographic findings were compared with nerve conduction study (NCS) for all the nerves studied except common peroneal nerve (CPN), as the NCS of CPN is not routinely done. DPN was classified as mild or moderate to severe on the basis of latency and velocity assessed by NCS. The mean CSA in all the examined nerves was higher in moderate to severe DPN than the mild DPN, but this was not statistically significant except for ulnar nerve with a P value of < 0.0001. Conclusion: HRU demonstrates a morphological change in patients with DPN in the form of an increase in CSAs, which was statistically significant. HRU can objectively complement other diagnostic investigations such as NCS. High resolution ultrasonography of peripheral nerves has the potential to become the investigation of first choice for the evaluation of DPN. Key Message: One of the complications of diabetes mellitus is diabetic peripheral neuropathy. Its diagnosis is primarily based on clinical examination and nerve conduction studies. The current study highlights the utility of high-resolution ultrasonography in demonstrating changes of diabetic peripheral neuropathy in the upper and lower limb nerves allowing for a non-invasive evaluation of this condition. With the evaluation of both the nerve and its surrounding structures being possible, it also has the potential to demonstrate other lesions masquerading as neuropathy. Thirty-seven adults with known diabetes, i.e., 24 males and 13 female patients, presenting with clinical features suggestive of DPN were included in the study. The youngest patient included in the study was 34 years of age, and the oldest was 70 years of age. Forty-five healthy non-diabetic volunteers with no clinical evidence of peripheral neuropathy, who had undergone blood sugar evaluation (i.e., normal fasting and random blood sugar level) in the past 1 year, which was found to be normal, were also selected. Out of the 45 healthy volunteers studied, 25 (55.5%) were males, and 20 (44.4%) were females. The youngest healthy volunteer included in the study was 30 years of age, and the oldest was 68 years of age. The healthy volunteers were drawn from hospital employees and colleagues. There was no significant difference noted in cross-sectional areas (CSAs) of all evaluated peripheral nerves in different genders of healthy volunteers and diabetic patients. The study was conducted over a period of 18 months. The institutional ethics committee and review board approved it, and informed consent was obtained from both the patients and the healthy volunteers. Clinical findings such as tingling, numbness, or any weakness in the hands and feet, and details of the NCS were noted in the patient group. A detailed sonographic examination of the peripheral nerves in healthy volunteers and patients was done in the right upper and lower limb using high resolution 5–18 MHz linear probe on Philips iU22 ultrasound system. All patients and healthy volunteers were examined in the supine position, except for the evaluation of common peroneal nerves (CPNs), where the patients were examined in the prone position. In our study, we preferred HRU of right-sided upper and lower limb peripheral nerves as electrophysiological studies, i.e. NCS, are routinely done on the right side. The peripheral nerves were identified by their predictable anatomic location and characteristic appearance. Nerves appear more echogenic than muscles and less echogenic than tendons. On a longitudinal scan, a nerve appears as multiple hypoechoic bands, corresponding to a neuronal fascicle, separated by hyperechoic lines, corresponding to the perineurium. On transverse scan, a nerve gives rise to the characteristic “honeycomb” appearance with a network of multiple rounded hypoechoic fascicle groups surrounded by hyperechoic peri- and epineurium. The measurements were also correlated with findings of NCS in all patients. The CSA of the examined nerves at various levels was expressed in mean and standard deviation, and using Student's t-test for normal distribution, we compared the difference between the mean values of the healthy volunteers and patients. The study included 45 healthy volunteers and 37 patients of diabetic mellitus presenting with symptoms of peripheral neuropathy. In the patient group, the duration of diabetic mellitus varied from 34 to 70 years with a mean age of 53.35 years. Out of the 37 patients studied, 24 (64.86%) were males, and 13 (35.13%) were females. The youngest patient included in the study was 34 years of age, and the oldest was 70 years of age. Forty-five healthy non-diabetic volunteers with no clinical evidence of peripheral neuropathy, who had undergone blood sugar evaluation (i.e., fasting and random blood sugar level) in the past 1 year, which was found to be normal, were also selected. Out of the 45 healthy volunteers studied, 25 (55.5%) were males and 20 (44.4%) were females. The youngest healthy volunteer included in the study was 30 years of age, and the oldest was 68 years of age. The healthy volunteers were drawn from hospital employee and colleagues. There was no significant difference noted in the CSAs of peripheral nerves in different genders of both groups. The mean CSA of the median nerve 5 cm proximal to the wrist crease was 11.61 ± 2.87 mm2 in patients with DPN, which was significantly higher than seen in healthy volunteers where the mean CSA was 7.09 ± 1.49. The mean CSA at the level of mid-forearm was 9.76 ± 2.95 mm2 in patients with DPN, which was also significantly higher than the value obtained in healthy volunteers where the mean CSA was 6.5 ± 1.31 mm2. The mean CSA at the elbow joint was 10.50 ± 2.27 mm2 in patients with DPN, which was significantly higher than the value seen in healthy volunteers where the mean CSA was 6.90 ± 1.43 mm2 [Figure 2]. The mean CSA of the ulnar nerve at the wrist joint was 7.22 ± 1.66 mm2 in patients with DPN, which was significantly higher than the value in healthy volunteers where the mean CSA was 5.56 ± 1.22 mm2. The mean CSA behind the medial epicondyle was 10.33 ± 3.45 mm2 in patients with DPN, which was significantly higher than the value in healthy volunteers where the mean CSA was 6.50 ± 1.41 mm2 [Figure 3]. The mean CSA of the posterior tibial nerve 3 cm above the medial malleolus in a patient with DPN was 7.99 ± 2.15 mm2, which was significantly higher than the value in healthy volunteers where the mean CSA was 5.97 ± 1.83 mm2 [Figure 4]. The mean CSA of CPN at the neck of the fibula was 11.38 ± 4.93 mm2 in patients with DPN, which was significantly higher than the value in healthy volunteers where the mean CSA was 6.75 ± 1.4 mm2 [Figure 5]. The correlation of the mean CSA of patients with peripheral nerve affliction based on the severity of DPN was in accordance with the findings of NCS. Median neuropathy was classified as mild or moderate to severe DPN on the basis of L and V assessed by NCS at the wrist, on the basis of criteria described by Watanabe T et al. The patients with motor nerve conduction V >52 m/s and L <4 ms of median nerve measured at the wrist joint were classified as having a mild DPN, and patients with motor nerve conduction V ≤52 m/s or L ≥4 ms on NCS were classified as having a moderate to severe DPN. In our study, 7 out of 37 patients were included in the mild DPN group, and 30 out of 37 patients were included in the moderate to severe DPN group, on the basis of the criteria defined above. The mean CSA of the median nerve 5 cm proximal to the wrist crease was higher in moderate to severe DPN (12 ± 3.63 mm2) than in patients with mild DPN (9.97 ± 1.92 mm2), but this difference was not statistically significant [Table 1]. Ulnar neuropathy was classified as mild or moderate to severe DPN on the basis of L and V assessed by NCS, as described by David C. Preston a nd Barbara E Shapiro. The patients with motor nerve conduction with V >49 m/s and L <3.4 ms of the ulnar nerve measured at the wrist joint were classified as having a mild DPN, and patients with V ≤49 m/s or L ≥3.4 ms on NCS were classified as having a moderate to severe DPN on the basis of nerve conduction velocity (NCV) values. In our study, 16 out of 37 patients were classified as mild DPN, and 21 out of 37 patients were classified as having a moderate to severe DPN on ulnar NCS. The mean CSA of the ulnar nerve at the wrist crease was higher in moderate to severe DPN (10.72 ± 2.46 mm2) than in the patients with mild DPN (7.28 ± 1.77 mm2). This difference was statistically significant with a P value of < 0.0001 [Table 2]. Patients with a posterior tibial neuropathy were classified as having a mild DPN when a V >42 m/s and a L <4.4 ms of the posterior tibial nerve measured at ankle joint was present. Patients with a V ≤42 m/s or a L ≥4.4 ms on NCS were classified as moderate to severe DPN. In our study, 10 out of 37 patients were classified as having a mild DPN, and 27 out of 37 patients were classified as having a moderate to severe DPN. The mean CSA of posterior tibial nerve 3 cm above the medial malleolus was higher in patients with a moderate to severe DPN (8.38 ± 2.18 mm2) as compared to that in patients with mild DPN (6.95 ± 1.75 mm2). However, this difference was not statistically significant. The mean CSA of the median nerve in our study was significantly higher (P < 0.0001) at all three levels of examination in patients with DPN than the healthy volunteers i.e., 11.61 ± 2.87 mm2 vs. 7.09 ± 1.49 mm2 at 5 cm proximal to the wrist crease, 9.76 ± 2.95 mm2 vs. 6.5 ± 1.31 mm2 at the level of mid-forearm, and 10.50 ± 2.27 mm2 vs. 6.90 ± 1.43 mm2 at the elbow joint. Our findings were in concordance with those of Watanabe T et al., who found that there is a significant increase in the CSA of the median nerve in patients with DPN as compared with the controls., The mean CSA of the median nerve in patients vs. healthy volunteers was 13.5 ± 2.8 mm2 vs. 9 ± 2 mm2, 9.1 ± 2.7 mm2 vs. 7.1 ± 1.6 mm2, and 7.2 ± 2.6 mm2 vs. 7.4 ± 3.2 mm2 at the carpal tunnel, 5 cm proximal to the wrist crease and at the elbow joint, respectively. Pitarokoili et al., also found an increased mean CSA (in mm2) of the median nerve in patients as compared to controls, i.e., 11.21 ± 2. 1 vs. 9.0 ± 1.58 at the carpal tunnel and 7.92 ± 2.14 vs. 6.6 ± 1.6 at mid-forearm. Similar findings have been reported by Afsal M et al., who found that on high-resolution sonography, there was a diffuse thickening of the peripheral nerve in these patients, and the mean CSA of the median nerve and ulnar nerve was found to be significantly higher in patients with DPN than the normal matched controls. The mean CSA of the median nerve of patients with DPN was 10.5 mm2 at the carpal tunnel, and 8.69 mm2 in the forearm 10 cm proximal to the wrist, whereas the CSA was 7.1 mm2 and 5.89 mm2, respectively at the same levels in controls. When the patients with DPN were classified into the “mild” and “moderate to severe” groups on the basis of motor nerve conduction V and L, the mean CSA of median nerve was higher in patients with moderate to severe DPN (i.e., 12 ± 3.63 mm2) than those with mild DPN (9.97 ± 1.92 mm2), but in our study, the difference was not statistically significant. The CSA of the ulnar nerve was significantly higher (P < 0.0001) at both the levels in DPN patients than in the healthy volunteers, i.e., 7.22 ± 1.66 vs. 5.56 ± 1.22 mm2 at the wrist joint, and 10.33 ± 3.45 vs. 6.50 ± 1.41 mm2 behind the medial epicondyle. Our findings were in concordance with that of Pitarokoili et al., who found that there was a significant increase in the CSA of the ulnar nerve, and it was greater in patients with DPN than in the controls, i.e., 6.30 ± 1.92 mm2 vs. 5.0 ± 0.94mm2 at the Guyon's canal and 8.34 ± 2.46 mm2 vs. 5.99 ± 1.57 mm2 behind the medial epicondyle., When we classified ulnar neuropathy in patients with DPN into the “mild” and “moderate to severe” groups on the basis of motor nerve conduction V and L described by David C. Preston, Barbara Ellen Shapiro, the mean CSA of ulnar nerve was significantly higher in patients with moderate to severe DPN than in those with mild DPN (P < 0.0001) and this difference was statistically significant. Similar findings were recorded by Afsal M et al. The CSA of the posterior tibial nerve was significantly higher (P < 0.0001) at 3 cm above the medial malleolus than that seen in the healthy volunteers (7.99 ± 2.15 vs. 5.97 ± 1.83 mm2). The CSA of the posterior tibial nerve was <7 mm2 in most of the healthy volunteers, whereas in the majority of patients with DPN, it was >7 mm2. The mean CSA of posterior tibial nerve was higher in patients with moderate to severe DPN than in those with mild DPN. Although the mean CSA of the patients and healthy volunteers examined in our study was lower than the mean CSA measured by Watanabe T et al., our finding that the mean CSA of the posterior tibial nerve in patients with DPN was significantly larger than the mean CSA in healthy volunteers was concordant with the findings of Watanabe et al. Similar findings were reported by Riazi S et al., Pitarokoili et al, that the mean CSA of the posterior tibial nerve (P TN) was larger in patients with DPN than in control subjects. Singh also found that the CSA and the maximum thickness of nerve fascicles of the tibial nerve are larger in patients with DPN than in healthy subjects or in diabetic patients with no signs of neuropathy. When the posterior tibial nerve neuropathy in patients with DPN was classified into the “mild” and “moderate to severe” types on the basis of motor nerve conduction V and L, the mean CSA of the posterior tibial nerve 3 cm above medial malleolus was higher in patients with moderate to severe DPN (8.38 ± 2.18 mm2) than that in patients with mild DPN (6.95 ± 1.75 mm2). However, this difference was not statistically significant. Such a correlation was not done in the previous studies. The mean CSA of CPN at the neck of the fibula was significantly higher (P value < 0.0001) in DPN patients than in healthy volunteers i.e., 11.38 ± 4.93 mm2 vs. 6.75 ± 1.4. In majority of the patients with DPN, i.e., 28/37 (75.68%), the mean CSA of the CPN was >9 mm2 at the neck of fibula and was between 9–12 mm2 in 43.24% of patients; and, in majority of the healthy volunteers i.e., 62.22%, the CPN mean CSA was between 6–9 mm2, and it was <9 mm2 in 93.33% healthy volunteers. The study by Pitarokoili et al., also showed similar results where the mean CSA (in mm2) of the fibular nerve at the fibular head was greater in patients than in the controls (i.e., 12.22 ± 4.97 vs. 7.2 ± 1.89). The correlation of HRU findings with NCS was not possible because this nerve is not routinely evaluated by NCS. Thus, enlargement of nerve size, as measured by CSA, was a common finding in all diabetic patients with neuropathy. Although the CSA of nerves, such as median, ulnar, posterior tibial, and common peroneal, varied with the severity of neuropathy, as determined by NCS, this was not statistically significant. Further studies with larger number of patients are probably required. The study shows the utility of HRU in demonstrating changes of DPN in a large number of upper and lower limb nerves, which have been previously evaluated in a few studies. This has the potential to allow for a non-invasive evaluation of DPN. HRU is more comfortable and less time-consuming as compared to electrodiagnostic testing. HRU is especially attractive because it allows the evaluation of multiple nerves over a long course. Peripheral nerves can be reliably demonstrated by HRU in both healthy volunteers and diabetic patients. HRU demonstrates an increase in CSAs in all peripheral nerves examined in a patient with DPN as compared to normal healthy volunteers. This difference was statistically significant. As a HRU allows the evaluation of both the nerve and its surrounding structures, it has the potential to demonstrate other lesions masquerading as neuropathy. Fornage BD. Peripheral nerves of the extremities: Imaging with US. Radiology 1988;167:179-82. Silvestri E, Martinoli C, Derchi LE, Bertolotto M, Chiaramondia M, Rosenberg I. Echotexture of peripheral nerves: Correlation between US and histologic findings and criteria to differentiate tendons. Radiology 1995;197:291-6. Sheppard DG, Iyer RB, Fenstermacher MJ. Brachial plexus: Demonstration at US. Radiology 1998;208:402-6. Peer S, Bodner G, Meirer R, Willeit J, Piza-Katzer H. Examination of postoperative peripheral nerve lesions with high-resolution sonography. AJR Am J Roentgenol 2001;177:415-9. Spratt JD, Stanley AJ, Grainger AJ, Hide IG, Campbell RS. The role of diagnostic radiology in compressive and entrapment neuropathies. Eur Radiol 2002;12:2352-64. Alemán L, Berná JD, Reus M, Martínez F, Doménech-Ratto G, Campos M. Reproducibility of sonographic measurements of the median nerve. J Ultrasound Med 2008;27:193-7. Watanabe T, Ito H, Morita A, Uno Y, Nishimura T, Kawase H, et al. Sonographic evaluation of the median nerve in diabetic patients: Comparison with nerve conduction studies. J Ultrasound Med 2009;28:727-34. Volpe A, Rossato G, Bottanelli M, Marchetta A, Caramaschi P, Bambara LM, et al. Ultrasound evaluation of ulnar neuropathy at the elbow: Correlation with electrophysiological studies. Rheumatology (Oxford) 2009;48:1098-101. Ng ES, Vijayan J, Therimadasamy AK, Tan TC, Chan YC, Lim A, et al. 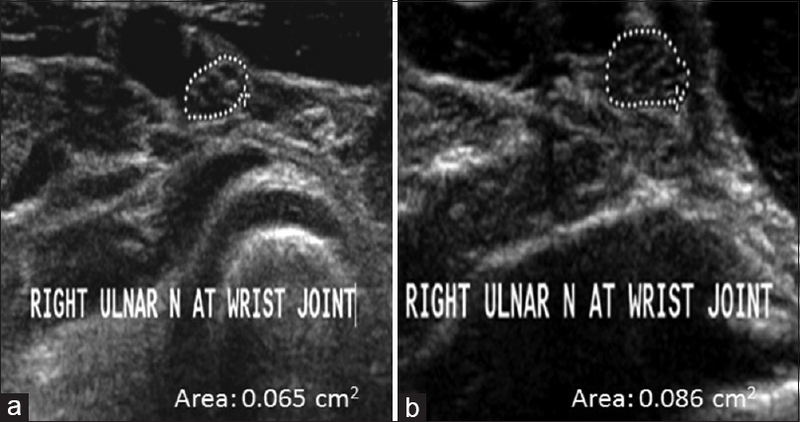 High resolution ultrasonography in the diagnosis of ulnar nerve lesions with particular reference to post-traumatic lesions and sites outside the elbow. Clin Neurophysiol 2011;122:188-93. Watanabe T, Ito H, Sekine A, Katano Y, Nishimura T, Kato Y, et al. Sonographic evaluation of the peripheral nerve in diabetic patients: The relationship between nerve conduction studies, echo intensity, and cross-sectional area. J Ultrasound Med 2010;29:697-708. Riazi S, Bril V, Perkins BA, Abbas S, Chan VW, Ngo M, et al. Can ultrasound of the tibial nerve detect diabetic peripheral neuropathy? A cross-sectional study. Diabetes Care 2012;35:2575-9. Chen SF, Huang CR, Tsai NW, Chang CC, Lu CH, Chuang YC, et al. Ultrasonographic assessment of carpal tunnel syndrome of mild and moderate severity in diabetic patients by using an 8-point measurement of median nerve cross-sectional areas. BMC Med Imaging 2012;12:15. Won SJ, Kim BJ, Park KS, Yoon JS, Choi H. Reference values for nerve ultrasonography in the upper extremity. Muscle Nerve 2013;47:864-71. Bathala L, Kumar P, Kumar K, Visser LH. Ultrasonographic cross-sectional area normal values of the ulnar nerve along its course in the arm with electrophysiological correlations in 100 Asian subjects. Muscle Nerve 2013;47:673-6. Zheng Y, Wang L, Krupka TM, Wang Z, Lu G, Zhang P, et al. The feasibility of using high frequency ultrasound to assess nerve ending neuropathy in patients with diabetic foot. Eur J Radiol 2013;82:512-7. Frijlink DW, Brekelmans GJ, Visser LH. Increased nerve vascularization detected by color Doppler sonography in patients with ulnar neuropathy at the elbow indicates axonal damage. Muscle Nerve 2013;47:188-93. Hobson-Webb LD, Massey JM, Juel VC. Nerve ultrasound in diabetic polyneuropathy: Correlation with clinical characteristics and electrodiagnostic testing. Muscle Nerve 2013;47:379-84. Bathala L, Kumar P, Kumar K, Shaik A, Visser LH. Normal values of median nerve cross-sectional area obtained by ultrasound along its course in the arm with electrophysiological correlations, in 100 Asian subjects. Muscle Nerve 2014;49:284-6. Hassan A, LeepHunderfund AN, Watson J, Boon AJ, Sorenson EJ. Median nerve ultrasound in diabetic peripheral neuropathy with and without carpal tunnel syndrome. Muscle Nerve 2013;47:437-9. Goedee HS, Brekelmans GJ, van Asseldonk JT, Beekman R, Mess WH, Visser LH. High resolution sonography in the evaluation of the peripheral nervous system in polyneuropathy-a review of the literature. Eur J Neurol 2013;20:1342-51. Ebadi H, Siddiqui H, Ebadi S, Ngo M, Breiner A, Bril V. Peripheral nerve ultrasound in small fiber polyneuropathy. Ultrasound Med Biol 2015;41:2820-6. Kang S, Kim SH, Yang SN, Yoon JS. Sonographic features of peripheral nerves at multiple sites in patients with diabetic polyneuropathy. J Diabetes Complications. 2016; 30:518-23. Gallardo E, Noto Y, Simon NG. Ultrasound in the diagnosis of peripheral neuropathy: Structure meets function in the neuromuscular clinic. J Neurol Neurosurg Psychiatry 2015;86:1066-74. Pitarokoili K, Kerasnoudis A, Behrendt V, Labedi A, Ayzenberg I, Gold R, et al. Facing the diagnostic challenge: Nerve ultrasound in diabetic patients with neuropathic symptoms. Muscle Nerve. 2016;54(1):18-24. Preston DC, Shapiro BE. Electromyography and Neuromuscular Disorders: Clinical-electrophysiologic Correlations. 4th ed. Cleveland, Ohio: Elsevier Butterworth-Heinemann; 2005. Lawande AD, Warrier SS, Joshi MS. Role of ultrasound in evaluation of peripheral nerves. Indian J Radiol Imaging 2014;24:254-8. Afsal M, Chowdhury V, Prakash A, Singh S, Chowdhury N. Evaluation of peripheral nerve lesions with high-resolution ultrasonography and color Doppler. Neurol India 2016;64:1002-9. Singh K, Gupta K, Kaur S. High resolution ultrasonography of the tibial nerve in diabetic peripheral neuropathy. J Ultrason 2017;17:246-52. Kanikannan MA, Boddu DB, Umamahesh, Sarva S, Durga P, Borgohain R. Comparison of high-resolution sonography and electrophysiology in the diagnosis of carpal tunnel syndrome. Ann Indian Acad Neurol 2015;18:219-25.